Our engagement began near the ocean. We married in a coastal city, in a round room, by the harbor. 20 years on, where else to celebrate but the ocean? 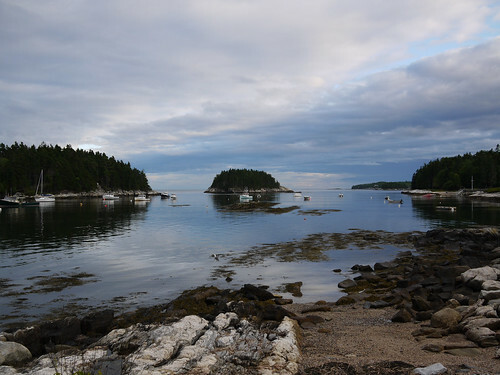 So we took ourselves to Maine this summer, stayed in a deliciously tacky motel by the harbor’s edge, in the middle of what turned out to be the Windjammer weekend celebration. Schooners sailed into the harbor. A parade went down the street, practically next to our road-side room. Lobsters heard us coming and scuttled into deeper, colder water for safety. But no such luck for them. We went to our favorite lobster spot (from whose dock you can see that view up at the top of this post). Repeatedly. And ate the giant, fresh-off-the-fishing boat shedders with our bare hands—no nut crackers required—our chins and elbows dripping with sea water. We drove up and down the coast, talking, as we often do, about someday moving to the ocean. We kept saying, “the goats would love it here”, when we really meant, “we would love it here”. But I know that’s just vacation-brain talking. Of course we love it there. What’s not to love? Beautiful landscapes, great food, the reliable repetition of the waves’ pulse on the shore. No work. No bills. No responsibilities. I remember when we first moved from a city that never felt like home to Vermont. It felt like we had moved to permanent vacation. When I went out to the mailbox, the air smelled like camping. The pine needles on our trail to the river felt soft and smelled of mornings waking in a remote camp site. The wood smoke from our first wood stove was intoxicatingly relaxing. The country drive to work revealed mountains, trees, farms, distant hovering clouds. I thought, I’ll never stop noticing all of this. But, unfortunately, I do. At least for a bit, when I’m in a rush for the week, running errands, meeting deadlines, making appointments, worrying about people. Then I remind myself to slow down. Look around. Observe. Look where I am? And look who I’m with? No matter where we live, if we’re together, it’s home.